Context: This study was undertaken considering the recent increase in infections caused by non-albicans Candida (NAC) species around the world. Candidemia is a major cause of nosocomial morbidity and mortality in neonates. Although Candida albicans remains the most common fungal isolate from blood, longitudinal studies have detected a trend toward an increased prevalence of NAC species. There are multiple risk factors like neonatal birth weights less than 1250 g, indwelling intravascular catheters and admission in the ICU that are responsible for the emergence of neonatal candidemia in recent years. Aims: To study the changing pattern and importance of species identification of Candida. Settings and Design: This is a three-year retrospective study. Materials and Methods: The neonates born or admitted during Jan. 2010-Dec. 2012 were included in the study. A total of 69 neonates with candidemia as evidenced by positive blood cultures were considered. All blood samples were collected aseptically and were processed by standard procedures. Statistical analysis used: No. Results: During the study period, a total of 922 samples were collected. Out of the 922 samples, 69 were found to be positive for candidemia. Out of the 69, 10 [14.4%] were identified as Candida albicans while the remaining 59 [85.5%] were identified as NAC species. Among the NAC species, 29/59 (49.1%) were Candida tropicalis, 26/59 (44.06%) were Candida krusei while 04/59 (6.7% were Candida glabrata). Conclusions: Candidemia due to NAC species increased morbidity, mortality and complications. In our study, we found the changing pattern of Candida species and importance of species identification in cases of neonatal candidemia. Species identification is important because NACs are resistant to azole drugs. The present retrospective study was carried out in the department of Microbiology of a multi-super specialty tertiary health care center located in the Central India region where patients are expected from different parts of Central India. A total of 922 peripheral venous blood samples  from neonates suspected of septicemia were collected aseptically and prior to antibiotic therapy during the period from January 2010 to December 2012. Blood culture was performed by automated Bact/Alert 3D system [Biomerieux]. The Bact/Alert R is a growth-based technology and works on the principle that as microorganisms grown, they produce CO 2 ; these systems use colorimetric detection of CO 2 production from the growth of organism. It is a qualitative procedure for enhanced recovery and detection of aerobic and facultative anaerobic microorganism (bacteria and fungi) from normally sterile body fluids, including blood. The culture bottles used in this system were aseptically inoculated with 2 ml of venous blood. The blood culture bottles that were indicated as positive were subcultured onto Blood agar and MacConkey agar media. Candida species identification was based on cultural characteristics, Gram stain and assessment by Germ tube test. Speciation of all isolates was done by chromogenic media [HiChrome, Hi Media Mumbai, Pvt. Ltd]. Strict quality control was followed during the entire study period. The procedure followed was in accordance with the ethical standards of the responsible committee. During the study period, a total of 922 samples were collected. Out of the 922 samples tested, 69 were found to be positive for candidemia. Out of the 69, 10 [14.4%] were identified as Candida albicans while the remaining 59 [85.5%] were identified as NAC species [Table 1] and [Figure 1]. 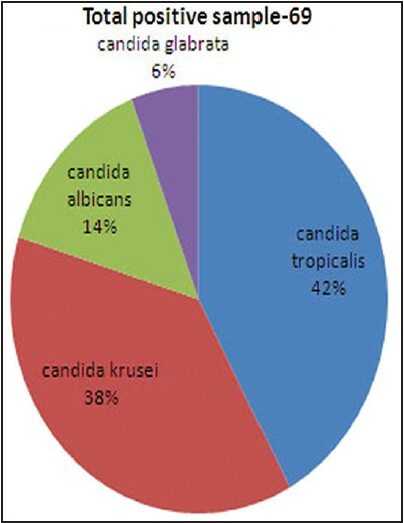 Among the NAC species, 29/59 (49.1%) were Candida tropicalis, 26/59 (44.06%) were Candida krusei while 04/59 (6.7%) were Candida glabrata [Table 1] and [Figure 1]. The prevalence of Candida glabrata among those causing human disease has increased significantly (Von-Zepelin et al. 1999, Pfaller and Diekema 2002), becoming the important cause of candidemia. It is interesting that Candida dubliniensis may develop resistance to fluconazole and this may possible have contributed to the emergency of the species in HIV carriers/AIDS patients. (Sullivan et al.). Besides, involvement of Candida krusei in pathological process has increased in the last few years. So, considering its resistance to fluconazole, it is widely used as an anti-mycotic prophylactic drug. In fact, a comparison between the incidence of disseminated Candida krusei in 1989 and 1990, the year in which fluconazole prophylaxis was introduced, showed that the latter practice led to an increase of such cases while no change was observed for Candida albicans and Candida tropicalis cases. Indeed Candida krusei became an important cause and it is difficult to treat cases of candidemia (Pfaller 2003). Nosocomial infection was connected with the presence of Candida parapsilosis on hospital equipment, personnel hands and infection of high-risk patients connected with such contamination. In our study, Candida tropicalis was found to be the commonest agent of Candida bloodstream infection followed by Candida krusei. While two other studies also reported Candida tropicalis in neonatal candidemia, , our study is comparable to the epidemiological studies carried out in different parts of our country indicating Candida tropicalis as the common cause of nosocomial candidemia. ,, Candida tropicalis is the second or third leading cause of candidemia. Candida tropicalis as a cause of fungemia in neonatal intensive care units have been linked to the presence of the fungus on the hands of the hospital personnel. Once introduced into a host with an impaired immune system, Candida tropicalis may be more virulent than Candida albicans and proceed from colonization to invasion more easily. A very low birth weight infant with an immature immune system may behave like an immunocompromised adult patient in this regard. Several studies have shown that rates of fungal colonization among very low birth weight neonates vary greatly, with Candida albicans and Candida parapsilosis being the most prevalent species. We found a relatively high incidence of Candida tropicalis colonization. In addition to endogenous infections, which are the most common, cause of fungemia in a neonatal intensive care unit have been connected to the presence of fungus on the hand of personnel. Increased prevalence of Candida krusei and emergence of Candida glabrata can be attributed to their innate resistance or indirectly due to the selective pressure resulting from its resistance to Azole drugs. , Candida glabrata that is found to be the predominant species in many countries, including United States  but less common in Asia-Pacific regions and Latin America, has started emerging in the Indian subcontinents. This finding has major clinical implications as the higher complication and mortality rate associated with the NAC species. Candida tropicalis appears to be more virulent than Candida albicans in patients with hematological malignancies, and disseminated infection is associated with high mortality rates. , Neonatal candidemia is generally associated with high mortality. In the present study, mortality rate (39.85%) is quite high. The change in the pattern of candidemia might be partly attributed to the increase in the number of immunocompromised hosts, low birth weight and prematurity, and widespread use of prophylactic or empiric antifungal therapy. This is an ominous sign given the in vitro resistance of the NAC species to currently available antifungal agents, specifically to azole derivatives. The present study emphasizes the clinical importance and mycological shift of Candida species in neonatal candidemia with predominance of NAC species in the Central India region. The emergence of new species of Candida as potential pathogens is a reflection of the changing scenario in medicine since the 1960s. The emergence of NAC species in causing candidemia could be due to the frequent hand carriage of Candida species in hospital personnel and antifungal drug pressure. Hence speciation of Candida in neonatal candidemia can reduce morbidity, mortality and antifungal drug pressure in the neonates. The authors wish to thank the Chairperson and Dean of the institute for providing laboratory facilities and healthy working atmosphere during the study period. The authors are also thankful to the technical staff of the institute for providing necessary helping hand during the endeavour. Benjamin DK Jr, Stoll BJ, Fanaroff AA, McDonald SA, Oh W, Higgins RD, et al; National Institute of Child Health and Human Development Neonatal Research Network. Neonatal candidiasis among extremely low birth weight infants: Risk factors, mortality rates, and neurodevelopmental outcomes at 18 to 22 months. Pediatrics 2006;117:84-92. Narain S. Neonatal systemic candidiasis in a tertiary care centre. Indian J Med Microbiol 2003;21:56-8. Jarvis WR. Epidemiology of nosocomial fungal infections, with emphasis on Candida species. Clin Infect Dis 1995;20:1526-30. Chakrabarty A, Singh K, Das S. Changing face of nosocomial candidaemia. Indian J Med Microbiol 1999;17:160-6. Oberoi JK, Wattal C, Goel N, Raveendran R, Datta S, Prasad K. Non-albicans Candida species in blood stream infections in a tertiary care hospital at New Delhi, India. Indian J Med Res 2012;136:997-1003. Edwards JE Jr. Candidiasis. In: Fauci AS, Kasper DL, Braunwald E, editors. Harrison Principles of Internal Medicine. 17 th ed. New York: Mc Graw Hill Companies; 2008. p. 1017. Ariff S, Saleem AF, Soofi SB, Sajjad R. Clinical spectrum and outcomes of neonatal candidiasis in a tertiary care hospital in Karachi, Pakistan. J Infect Dev Ctries 2011;5:216-23. Adib SM, Bared EE, Fanous R, Kyriacos S. Practices of Lebanese gynecologists regarding treatment of recurrent vulvovaginal candidiasis. N Am J Med Sci 2011;3:406-10. District Laboratory practice in tropical countries part 2 Monica Cheesbrough; 2000. Bailey and Scott's. Diagnostic Microbiology. In: Betty A, Forbes Daniel, Sahmalice S, editors. 11 th ed. Weissfelp. Baron EJ, Weinstein MP, Dunne WM Jr, Yagupsky P, Welch DF, Wilson DM. Cumitech 1C Blood cultures iv. Coordinating. In: Baron EJ, editor. Washington: ASM Press; 2005. Morrell M, Fraser VJ, Kollef MH. Delaying the empiric treatment of Candida bloodstream infection until positive blood culture results are obtained: A potential risk factor for hospital mortality. Antimicrob Agents Chemother 2005;49:3640-5. Almirante B, Rodríguez D, Cuenca-Estrella M, Almela M, Sanchez F, Ayats J, et al. Epidemiology, risk factors, and prognosis of Candida parapsilosis bloodstream infections: Case-control population-based surveillance study of patients in Barcelona, Spain, from 2002 to 2003. J Clin Microbiol 2006;44:1681-5. Roilides E, Farmaki E, Evdoridou J, Francesconi A, Kasai M, Filioti J, et al. Candida tropicalisin a neonatal intensive care unit: Epidemiologic and molecular analysis of an outbreak of infection with an uncommon neonatal pathogen. J Clin Microbiol 2003;41:735-41. Goel N, Ranjan PK, Agarwal R, Chaudhary U, Sanjeev N. Emergence of non-albicans Candida in septicaemia and antifungal susceptibility: Experience from a tertiary care centre. J Lab Physicians 2009;1:53-5. Agarwal J, Bansal S, Malik GK, Jain A. Trends in neonatal septicaemia: Emergence of non-albicans Candida. Indian Pediatr 2004;41:712-5. Rani R, Mohapatra NP, Mehta G, Randhawa VS. Changing trends of Candida species in neonatal septicaemia in a tertiary North Indian hospital. Indian J Med Microbiol 2002;20:42-4. Finkelstein R, Reinhertz G, Hashman N, Merzbach D. Outbreakof Candida tropicalis fungemia in a neonatal intensive care unit. Infect Control Hosp Epidemiol 1993;14:587-90. Kuhn DM, Mikherjee PK, Clark TA, Pujol C, Chandra J, Hajjeh RA, et al. Candida parapsilosis characterization in an outbreak setting. Emerg Infect Dis 2004;10:1074-81. Pfaller MA, Diekema DJ, Rinaldi MG, Barnes R, Hu B, Veselov AV. Results from the ARTEMIS DISK Global antifungal surveillance study: A 6.5-year analysis of susceptibilities of Candida and other yeast species to fluconazole and voriconazole by standardized disk diffusion testing. J Clin Microbiol 2005;43:5848-59. Shivaprakasha S, Radhakrishnan K, Karim PM. Candida spp. other than Candida albicans: A major cause of fungemia in a tertiary care centre. Indian J Med Microbiol 2007;25:405-7. Verma AK, Prasad KN, Singh M, Dixit AK, Ayyagari A. Candidaemia in patients of a tertiary health care hospital from north India. Indian J Med Res 2003;117:122-8. Saiman L, Ludington E, Dawson JD, Patterson JE, Rangel-Frausto S, Wiblin RT, et al; National Epidemiology of Mycoses Study Group Risk factors for Candida species colonization of neonatal intensive care unit patients. Pediatr Infect Dis J 2001;20:1119-24. Kothari A, Sagar V. Epidemiology of Candida bloodstream infections in a tertiary care institute in India. Indian J Med Microbiol 2009;27:171-2. Kothavade RJ, Kura MM, Valand AG, Panthaki MH. Candida tropicalis: Its prevalence, pathogenicity and increasing resistance to fluconazole. J Med Microbiol 2010;59:873-80. Krcmery V, Barnes AJ. Non-albicans Candida spp. causing fungaemia: Pathogenicity and antifungal resistance. J Hosp Infect 2002;50:243-60. Leung AY, Chim CS, Ho PL, Cheng VC, Yuen KY, Lie AK, et al. Candida tropicalis fungaemia in adult patients with haematological malignancies: Clinical features and risk factors. J Hosp Infect 2002;50:316-9.